Original handcrafted knife, made of aircraft aluminium. 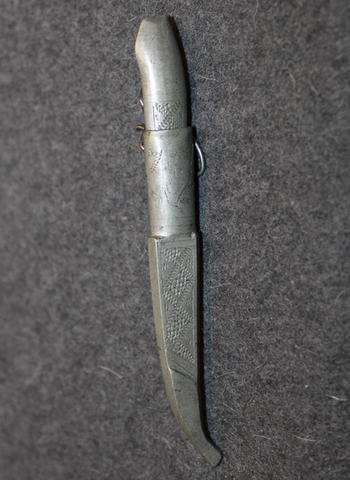 This kind of "puhdetyö" handcrafted knives were made by soldiers while off duty in bunkers, just to pass the time. Knife ( Puukko in Finnish dialect ) is one of the most important symbols in Finnish culture, as it was one of the most essential tools, served as cutlery, and they were used as means of self-defense or war. Puukko is part of Finnish national character, and there is still plenty of skilled knife-smiths in Finland. This specimen is small but well made, cast aluminium, and blade may be one nail or other piece of iron. There is some corrosion, and other defects, there is also an engraving on scabbard, "muisto" meaning memory. There is no certainty when this specimen was made and who made it is also not known. Delivery in track and trace methods only. PK 1918, Finnish red guard membership pin.